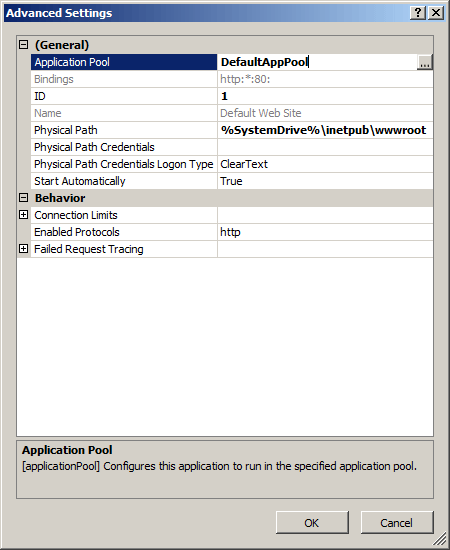 The <add> element of the <applicationPools> element controls the configuration settings for an IIS 7 and later application pool. You create an <add> element in the ApplicationHost.config file for each application pool that you want to run on your IIS server. The <add> element can contain attributes and child elements that configure the pipeline processing mode and the version of the .NET Framework the worker processes in the application pool use for incoming requests. This element also contains child elements that configure application pool identity, performance, and health and recycling application pool settings. 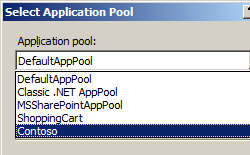 When you create a new application pool on IIS 7 and later, at a minimum you must assign the application pool a unique name. Configure all other properties as needed for the applications that use the application pool. Starting in IIS 7.5, you can configure an application to start automatically by using the managedRuntimeLoader, CLRConfigFile, and startMode attributes of the <add> element. These attributes configure, respectively, the name of the managed DLL that provides runtime loading for your application, the common language runtime configuration file for the application, and the startup type for the application. Also new in IIS 7.5 and later is a new ApplicationPoolIdentity type for the identityType attribute of the <processModel> element. This new identity type is now the default process identity for applications, and makes it possible to set the security for your content areas to allow access for a specific application pool. To do so, you would set your security using the name of an application pool by using syntax like "IIS AppPool\DefaultAppPool." This identity is created dynamically, thereby dramatically reducing the surface attack area of your server. IIS 8.0 The default value of the managedRuntimeVersion attribute was changed to "", and v4.0 was added as a value for managedRuntimeVersion. IIS 7.5 The <add> element of the <applicationPools> element was updated in IIS 7.5 to include attributes that allow you to preload applications. IIS 7.0 The <add> element of the <applicationPools> collection was introduced in IIS 7.0. IIS 6.0 The <applicationPools> collection replaces portions of the IIS 6.0 IIsApplicationPools metabase property. 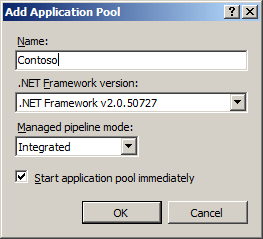 In the Add Application Pool dialog box, enter the name of the application pool in the Name: box, in the .NET Framework version: drop-down list select the .NET Framework version your site or application uses, in the Managed pipeline mode: drop-down list select Integrated or Classic, and then click OK. In the Connections pane, expand Sites, and then navigate to the Web site or application you want to add to the application pool. In the General section of the Advanced Settings dialog box, click the Application Pool entry, and then click the ellipses button. 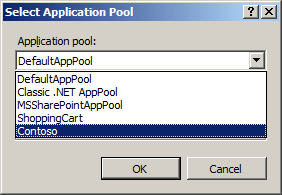 In the Select Application Pool dialog box, select the application pool from the Application pool: drop-down box, click OK, and then click OK again. The <add> element of the <applicationPools> collection is configurable at the server level in the ApplicationHost.config file. When true, indicates to the World Wide Web Publishing Service (W3SVC) that the application pool should be automatically started when it is created or when IIS is started. Specifies the .NET configuration file for the application pool. When true, enables a 32-bit application to run on a computer that runs a 64-bit version of Windows. When true, indicates that delegated settings in Web.config files will processed for applications within this application pool. When false, all settings in Web.config files will be ignored for this application pool. Specifies the request-processing mode that is used to process requests for managed content. The managedPipelineMode attribute can be one of the following possible values. Specifies that the application pool use separate IIS and ASP.NET request-processing pipelines, which works with ASP.NET 1.1 applications, and ASP.NET 2.0 or later applications that do not work in Integrated mode. Specifies that the application pool use the integrated IIS and ASP.NET request-processing pipeline, which works with only ASP.NET 2.0 or later applications. Specifies the managed loader to use for pre-loading the application pool. The default value is webengine4.dll. Specifies the CLR version to be used by the application pool. The managedRuntimeVersion attribute can be one of the following possible values. Specifies that the application pool use the CLR version 1.1. Specifies that the application pool use the CLR version 2.0, which can be .NET Framework version 2.0, 3.0, or 3.5. Specifies that the application pool use the CLR version 4.0, which can be .NET Framework version 4.0 or 4.5. Specifies a unique name for an application pool on the server. If true, the Windows Process Activation Service (WAS) creates and passes a token for the built-in IUSR anonymous user account to the Anonymous authentication module. The Anonymous authentication module uses the token to impersonate the built-in account. When PassAnonymousToken is false, the token will not be passed. Note: The IUSR anonymous user account replaces the IIS_MachineName anonymous account. The IUSR account can be used by IIS or other applications. It does not have any privileges assigned to it during setup. Indicates to HTTP.sys how many requests to queue for an application pool before rejecting future requests. The default value is 1000. When the value set for this property is exceeded, IIS rejects subsequent requests with a 503 error. If the loadBalancerCapabilities setting is true, the connection is closed instead of rejecting requests with a 503. 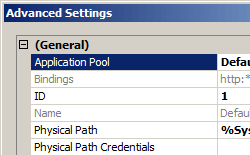 For more information about loadBalancerCapabilities, see Failure Settings for an Application Pool. Specifies the startup type for the application pool. The startMode attribute can be one of the following possible values. Specifies that the Windows Process Activation Service (WAS) will always start the application pool. This behavior allows an application to load the operating environment before any serving any HTTP requests, which reduces the start-up processing for initial HTTP requests for the application. Specifies that the Windows Process Activation Service (WAS) will start the application pool when an HTTP request is made for an application that is hosted in the application pool. This behavior resembles the WAS behavior in previous versions of IIS. The default value is OnDemand. cpu Configures CPU affinity and CPU actions. environmentVariables Configures a collection of environment variables to pass to worker processes. failure Configures actions to take when an application pool fails. processModel Configures process management attributes for an application pool. recycling Configures application pool recycling. 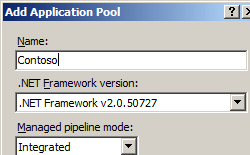 The following configuration sample uses the application pool <add> element to create a new application pool named Contoso. The <recycling> element configures logging for application pool restarts, the <periodicRestart> element configures when the application pool restarts, and the <processModel> element configures the shutdownTimeLimit and startupTimeLimit attributes for shutting down and starting the worker processes in the application pool for 30 seconds each. If these time limits are exceeded, IIS terminates the worker process. The following code examples add an application pool named Contoso to your IIS 7 and later server, then set the application pool to daily recycle at 3:00 A.M.